It was one of those miserable late-July days on Chesapeake Bay when the heat and humidity were so high we wished we’d packed scuba gear to breathe. To make things more miserable, a thick, sloppy soup of moist smoke from a marsh fire had wafted across the glassy waters around the Chesapeake Bay Bridge-Tunnel. Still, my friend and I were amped as we motored around the bridge pilings. 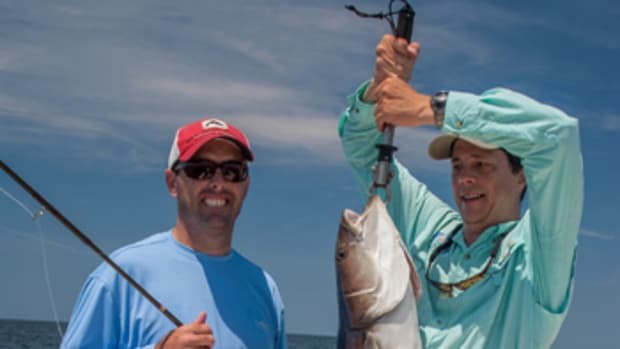 We knew this type of weather provided ideal conditions for hooking up with monster cobia — a somewhat mysterious fish with serious pulling power. Cobia — also known as blackfish, ling and lemonfish, among other names — are lean, brown, streamlined gamefish that can top 130 pounds and exhibit Mr. Universe strength when hooked. 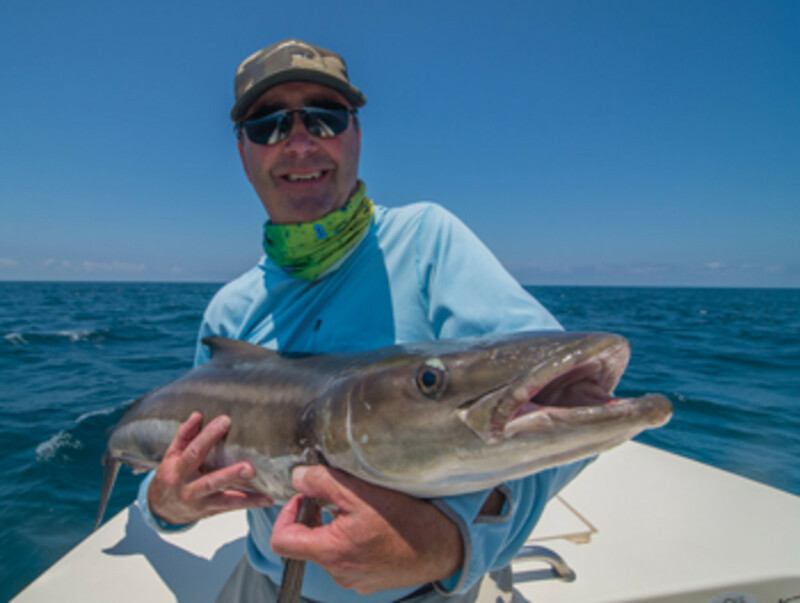 Bay anglers often call cobia “The Man in the Brown Suit.” They can be found in many temperate waters around the world, but American anglers focus on the fishery between the Gulf of Mexico and Cape Cod, Massachusetts. 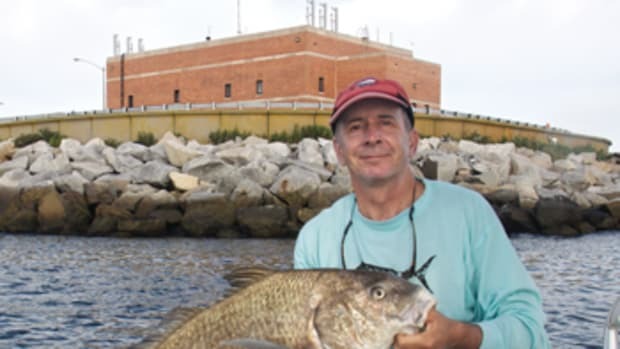 from the Choptank River south to the mouth of the Bay. A healthy population also summers off the resort beaches from Delaware’s Cape Henlopen to North Carolina’s Cape Hatteras. Cousins with the remora — the fish you see swimming with sharks in nature films — cobia have a handful of remora-like habits that make finding them a good bit of fun. One habit is following just behind or under other sea creatures, such as turtles, rays and sharks, scavenging a leftover meal. It’s not unusual to see the orange head of a loggerhead turtle pop up around the mouth of Chesapeake Bay with cobia right behind or beneath it. Sometimes a school of cownose rays will have several cobia mixed in. When they’re not tagging along, cobia can be found cruising the surface, holding over or in structure, or hiding under navigation buoys. Targeting them by sight with spinning or fly gear is the most fun. Tactics change, depending on where you’re fishing, so we’ll focus on how Chesapeake anglers typically wrangle cobia. A common tactic around the Chesapeake Bay Bridge-Tunnel — and other areas — is simply motoring around looking for cobia cruising the surface. That’s exactly why hot, calm days are good for cobia fishing: The weather makes them easy to see just below the surface. In fact, it’s not uncommon to see boats with cobia towers cruising the Lower Bay, as skippers keep a lookout from on high. Cobia also love to hang out under floating navigation aids, such as can, nun and other buoys, so running and gunning from buoy to buoy is another way to locate them. Be sure to approach slowly, quietly and from a distance. You’ll often see them just beneath the buoy or swimming close to its anchor chain. As you’re motoring, also keep an eye out for those previously mentioned critters, including turtles, rays and the occasional shark. And don’t neglect bridge and pier pilings where there’s moving water. Cobia often tuck into these and use them as ambush points. Once you’ve found a cobia — or, hopefully, a group of them — it’s time to lock and load. Fly anglers will want to gear up with at least an 11-weight rod with a large-arbor reel spooled with an intermediate fly line and a 50-pound fluorocarbon tippet. Folks hoping to tangle with a cobia on spinning gear will want a medium-heavy 7- to 8-foot rod and a 3000- to 4000-series high-speed, high-capacity reel spooled with 30- to 50-pound braid and terminated with an 8-foot, 50-pound fluorocarbon leader. 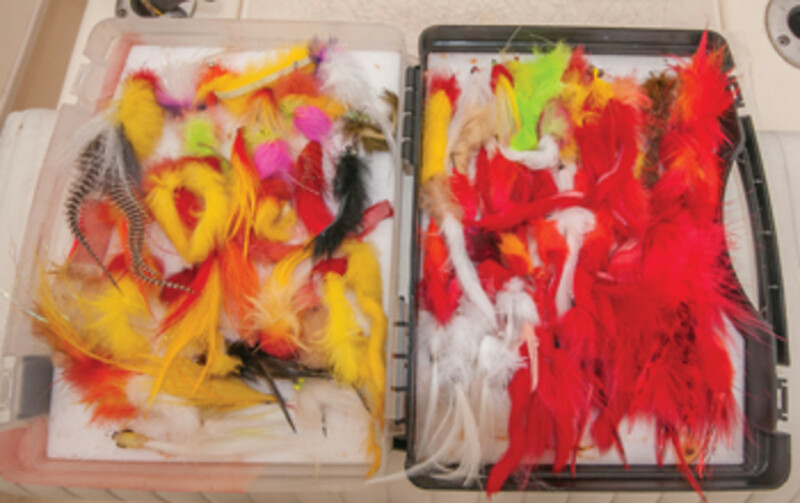 Though cobia aren’t usually fussy in the fly pattern department, they seem partial to red and yellow, black, and purple and black patterns on 2/0 to 4/0 hooks tied with rabbit fur strips — with or without a hackled collar. 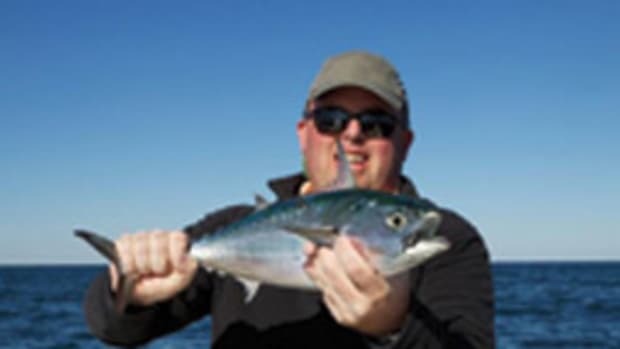 A set of heavy dumbbell eyes helps get the fly and its bulky materials down in the water column. When you think a cobia might be selective, try different colors and other patterns. I’ve caught them on everything from large, white 4/0 half-and-half Clousers to large poppers. 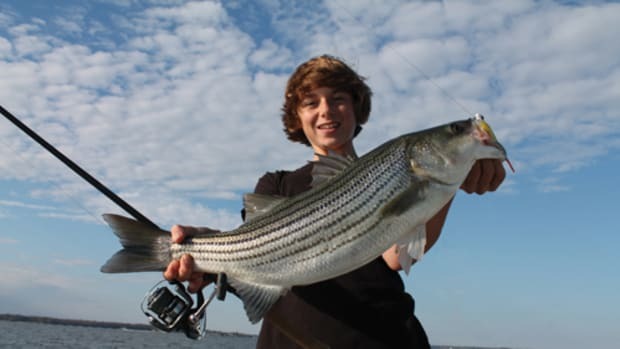 Folks using spinning gear can generally fish with any lure they’d use for striped bass, but 2- to 4-ounce black, purple, red, yellow or multicolored bucktails with or without various soft plastic tails are a good start. Eight- to 10-inch eel-like soft plastics — Bass Kandy Delights, Gulp! Alive! eels or any other wriggly looking pattern — on an appropriately weighted jig head can be deadly. And when all else fails, there’s nothing like a live eel on a 2/0 to 4/0 circle hook to get a cobia to bite. They usually can’t resist the sight of one. If you’re lucky, you’ll find cobia in one or more of the aforementioned scenarios: swimming with other creatures, holding under a buoy, hiding in structure or cruising the surface. Once you’ve sighted them, it’s only necessary to get your lure or fly within the cobia’s range of sight and work it properly. 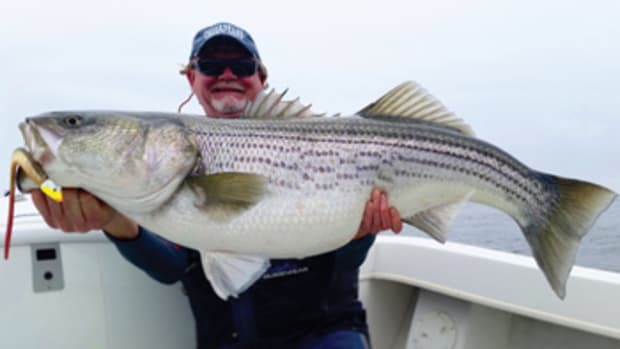 You may have to motor alongside a moving fish and cast ahead of it to get it in the strike zone. If you find a fish amid bridge pilings, cast your offering and set it up to drift with the current. If you work it correctly, the fish will ambush it with the force of a tank. Once hooked up, the most important thing to do is get the fish away from the bridge pilings, where it will almost always head in a panic. If you have a big one on, settle in — it usually will be an epic battle. 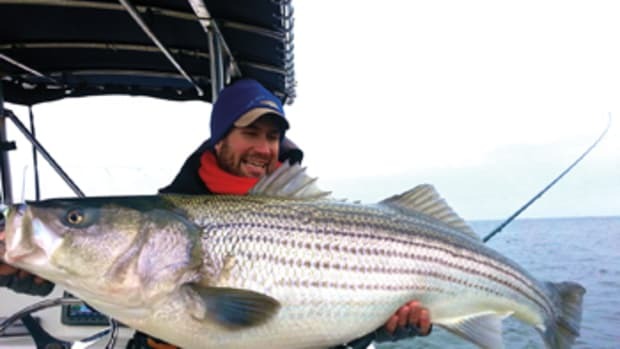 When you have the beast boat-side, be sure you’re tuned in to local laws and regulations before deciding whether to keep the fish to eat. The cobia fishery has been under scrutiny, and states are changing their regulations to line up with federal guidance. That said, cobia are quite tasty and have a firm texture that makes them great for the grill. 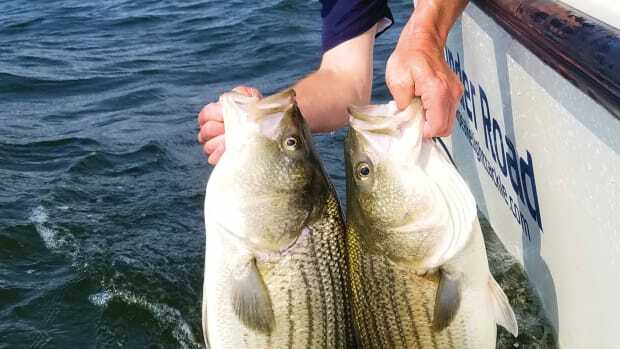 Otherwise, minimize handling and try to keep the fish in the water for the safest catch and release. You might be wondering if we caught any cobia on that sweltering July day. Though we didn’t trick any true monsters, we did hook up with plenty of 20-pounders hiding under buoys — a blast to wrestle on fly tackle. 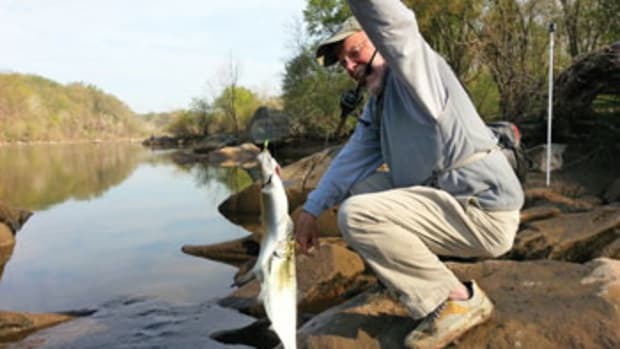 Finding them and launching the right lure or fly is the other half of the fun.